Are you a data nerd? If you’re like me, I love it when I can backup a decision, or rather ask my boss for investment in a resource when I have all the supporting data points. While some sales organizations are fortunate enough to have a comprehensive sales stack to help them save time, decrease their sales cycle and win more business, others (perhaps you, if you’re reading this) need a bit more help proving the value of investing in a sales intelligence resource. Sales intelligence platforms source a HUGE amount of prospecting data, and here’s the best part – they keep it verified for you. Take a second to actually think about that – right now, how long is it taking you to find decision-maker information, and then complimentary details like which agencies they’re working with or how much they spent on digital last quarter? Next, imagine how fast that data is going stale. According to our research, which you’ll see below, during a four month period 7% of people will exit their current company. So, if you’re already wasting too many hours hunting down qualified prospects, imagine repeating that awful cycle every four months. 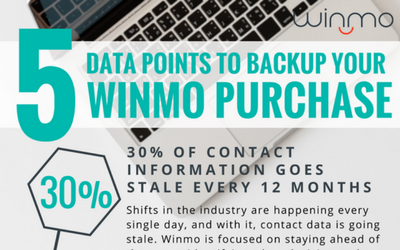 Likely you know this pain point very well, but here are some data points to help convince your boss the investment in Winmo is well worth it. Zoe has been with List Partners Inc. for almost two years. In her latest Content Marketing role, Zoe continues her mission to create content to help drive new business opportunities for clients and readers alike.